We live in a world filled with things to explore, and most importantly our relationship with the vastness of this world. When we take a deep dive into this state of not knowing, it really is about knowing what you don’t know and to me that seems to be much of my world. As I have aged I see the world with the eyes of a child, looking at it with newness, wonder and fulfillment it is a blessing. 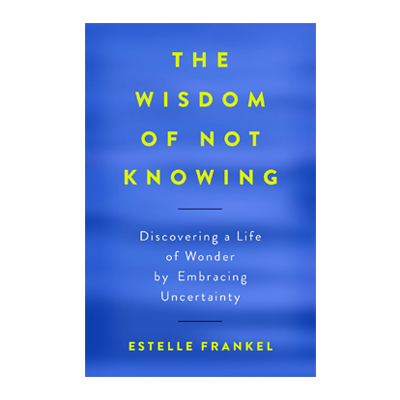 In my interview with author Estelle Frankel about her new book “The Wisdom of Not Knowing-Discovering a Life of Wonder by Embracing Uncertainty” We discuss the the deeper wisdom that emerges out of silent, white spaces between the lines of our stories. It is a meditation on how expanding our awareness of life’s great mysteries enables us to connect with unknown part of ourselves. “The unknown occupies an important place in all the world’s religious traditions. It is the realm where faith operates. In Jewish mysticism, divinity is the ultimate unknown and unknowable reality that, paradoxically, we are enjoined to “know” This essential paradox lies at the heart of the spiritual quest”, states Estelle. If you are on your own spiritual quest and want to take a deeper look at what the “unknown” can bring with all its uncertainty then you have stumbled upon the right book to guide you through your quest. There is simplicity, beauty and awe in uncertainty, it is where you are most creative. To learn more about “The Wisdom of Not Knowing” please click here to be directed to Estelle’s website. You can also learn more about Estelle Frankel by visiting her Facebook page.